I’m sure you already know that today is National Popcorn Day. The origins of this holiday are unclear, and it is even more mysterious given that National Popcorn Month is October. Hmm. In order to facilitate your celebration, I want to be sure that you know about The Mad Popper. It is a sensational gourmet popcorn shop located at Homestead Market on NC-54. The owner is Stephany Heckman, a very nice person who works incredibly hard to produce an excellent product. I can testify that their caramel popcorn is the best I’ve ever had, and all of their popcorn is excellent. Each week they have two specialty popcorns. This week’s chocolate cheesecake is fabulous. In celebration of National Popcorn Day, Stephany is offering a 40% discount today on all in-store purchases. How great is that? 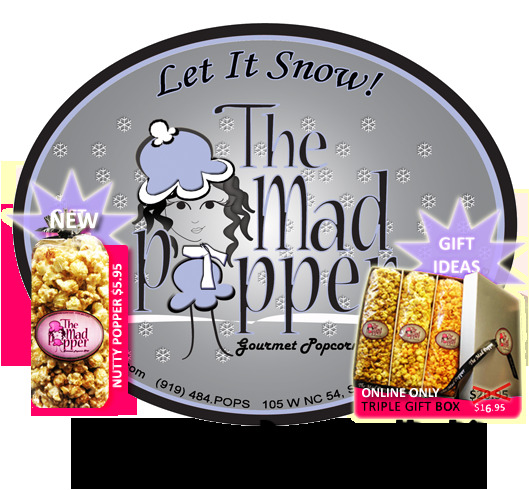 I have no financial stake in the success of The Mad Popper, except that I will continue to have a supply of great popcorn as long as the store continues to prosper. Check it out. Excludes tin refills, special orders and Popcorn of the Month subscriptions. Not valid with any other offer.Valid ONLY January 19, 2010. One coupon per customer, please. In store only. I love popcorn as well. I lived off of movie theater popcorn during college. Audrey Williams is a popcorn aficionado as well and she has found a GREAT place to get popcorn in Wilmington. It’s called Vic’s Popper and it’s on Shipyard Blvd. I highly recommend grabbing a bag if you are in the area. So, the big question is, where does popcorn stand in relation to Krispy Kreme donuts? I choose not to choose. Both are perfect foods. Think of popcorn as an appetizer and Krispy Kremes as a dessert. January 19th (today) is also National Champagne Day. Tomorrow, January 20th, is Penguin Awareness Day. And Thursday (the 21st) is National Hugging Day. So, live it up – eat popcorn, drink champagne, and hug a penguin. And the fun doesn’t stop here. Next Monday (the 25th), you can enjoy a hot beverage in honor of National Irish Coffee Day while staring out a window to commemorate National Observe the Weather Day. This all builds up to the grand finale of January celebrations – National Kazoo Day (Jan 28th). Note: January celebrations that have already passed include National Science Fiction Day, National Creme Puff Day, National Spaghetti Day, Winnie The Pooh Day, National Thesaurus Day, World Literacy Day, and Woman’s Appreciation Day. Plan early for next year! P.S. Krispy Kreme fans have plenty of time to save up for National Donut Day on June 5th. Thanks for the recommendation, Mike! I too am a popcorn lover and had not heard about The Mad Popper. I went there last night after reading your post and purchased samples of their goods. I am very impressed and am glad I know where to go for some special popcorn. You were right about the caramel!